Needing to call to an out-of-country colleague, I resorted to Google Talk. Within gmail, I quickly turned on Google Chat (at the bottom of my gmail page, required for making phone calls), made myself invisible (using "set status here" on left side-bar; to avoid disturbances during the call) and then I hit the "Call Phone" button (left side-bar). The call quality was crystal clear. I just checked my Skype connection, and was able to log into my account and hold a reasonably long audio call. 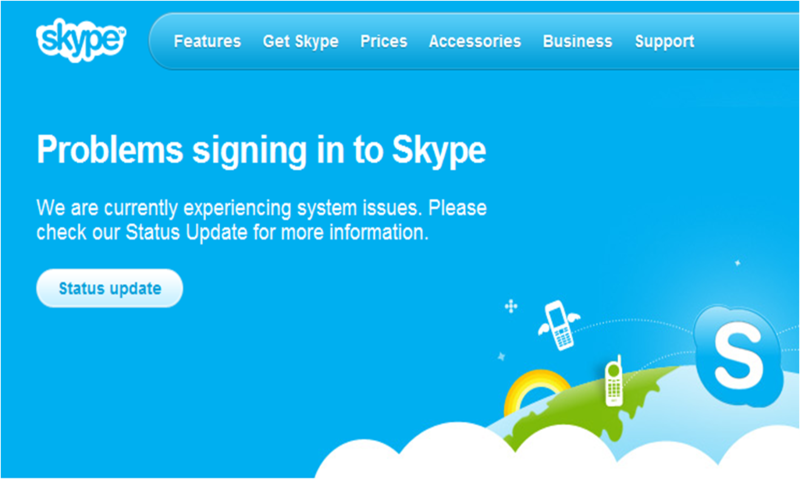 The error message still appears on the Skype webpage, but their status update page says that they are working on fixing the problem and that "more and more people are now able to use Skype once again". Their blog tells that they are experiencing very high usage right now -- approximately over 10 million users. Is this due to the upcoming Christmas holiday? What will happen on New Year's?